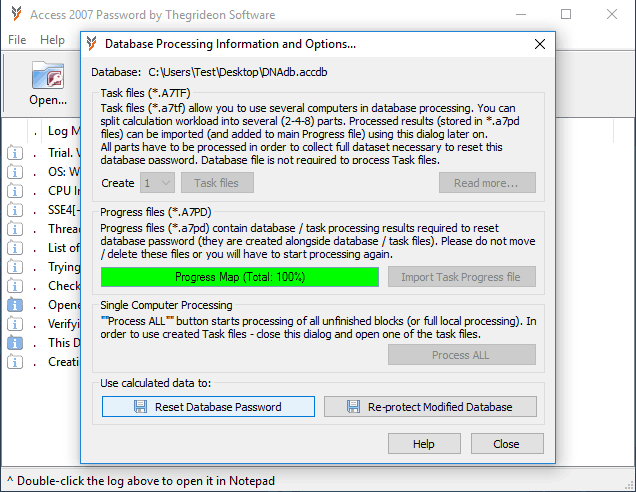 Access 2007 Password by Thegrideon Software is a unique tool to reset any Access 2007 database (.accdb) password with guarantee. It can also be used to re-protect modified database to its original encryption, thus editing without password recovery is possible (with limitations). Access 2007 Password works with databases in MS Access 2007 format only. You may also check other MS Access tools. The unique Access 2007 password replacement technology with guaranteed result. Original encryption can be re-applied to processed and modified database. Works with protected database regardless of passwords length and complexity. Highly optimized code (SSE, AVX) guarantees best performance. Up to 8 computers can be used in parallel with the Task files technique. Can be run on Cloud computing services such as Amazon EC2 and MS Azure. Access 2007 Password allows you to replace lost or unknown password of any encrypted database in Access 2007 format with the new one by calculating the set of encryption and correction values needed to modify original database. Due to technique used the original password length or complexity is not important. The calculations are based on internal fixed length structures so the processing time is almost identical for any database with the slight variation of 10-15%. Access 2007 Password also allows you to re-protect modified database (encrypt back with unknown password), so protected database can be edited without password recovery. Re-protection can be applied to Access 2007 database smaller or equal in size to the protected original! Please note: Database can grow in size and change dramatically with a single bit changed or stay almost the same with lots of data edited, so good MS Access skills are required for some database re-protection. Processing time is approximately equal to just 5-6 characters password search with the fastest possible password recovery tool (the real tools are way slower), so if your database password is not 3-4 characters long – our tool is the fastest way to access your data with guarantee! If the fast enough hardware is not available and database is required urgently you can use our service. Please contact us for details. Access 2007 Password allows you to split processing workload between several computers by the means of Task files. 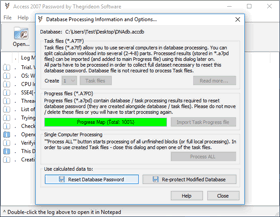 You can create 2, 4 or 8 Task files to process database data in parallel. Task files contain crypt-data to be processed and technical details, but no personal or "useful" information from your database. Database file itself is not required to process Task files, so you can send these files for remote processing without leaking any database content. Trial version allows you to process databases and task files and generate data required for password replacement. Unprotected database can be saved from registered version only.